Welcome to www.holidays-isleofman.com, home of the Travellers Guide to Isle of Man, a useful resource to help you plan and book your next holiday, short break, business trip or family holiday to Isle of Man. On this site we offer a wide range of holiday accommodation suitable for families, groups and couples, all of which is bookable online 24 hours a day! View the latest Isle of Man Events which include the 2014 TT Races. The Isle of Man is a small and beautiful island, 33 miles in length and 13.5 miles wide with 100 miles of coastline. The Isle of Man is famous for it's annual TT Races, a series of motor-cycle races which attract people from all over the world. Golf is another big attraction on the Isle of Man, with 9 golf courses it makes a great golfing holiday destination! Within easy reach of England, Scotland, Ireland and Wales, the Isle of Man is the perfect destination for a relaxing break or summer holiday. 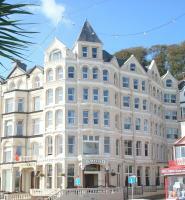 Discover more about the Isle of Man in our Isle of Man tourist information section. The Isle of Man is a fantastic golfing destination and despite the islands compact size, it manages to offer nine golf courses, eight of which are 18-hole. With courses than can challenge even the best golfers, from championship golf courses, there are courses to suit all abilities and standards, and when a game is not going to plan, the breath-taking scenery such as the stunning coastal views and heather moorlands that surround you, will make losing a little more enjoyable! The Isle of Mans climate means that golf is virtually a year-round activity and the UK is less than an hour away by plane, two and a half hours by Seacat, or a leisurely ferry journey lasting a little under four hours. Read more about golfing on the Isle of Man and the Isle of Man golf courses. Located in a prime, central position on the Victorian promenade overlooking Douglas Bay and is just a short walk from Douglas town centre. The Empress Hotel has been extensively upgraded. Fully equipped gymnasium, sauna, steam room and a lounge to relax in. Health & Beauty Treatment rooms offer a relaxing and energising treatments including facials, waxing and massages.